What to be expected from a Championship debut? Just about anything. Palmeiras kicked off this year’s edition of the Brasileirão with a sad déjà vu from exactly ten years back: in the second division. The priority is one: bounce back immediately. Doesn’t have to be pretty. Just make it happen. And from that point of veiw, the three points against Atlético Goianense – expected to be up there fighting for one of the four ascension tickets – was satisfactory. In terms of performance, not so much. Coach Kleina tried a new formation with three strikers: Vinícius, Leandro and Kleber. Doesn’t help much if the ball doesn’t reach them through anything but long passes from the flanks: that’s not Palmeiras, has never been. We’re still short of a #10, a legit playmaker. Tiago Real hasn’t caught on yet, might never quite live up to high expectations. Summing up: Bruno played well and made important saves, Charles was solid on the midfield. Tiago Real gets his kudos for the winning header. Leandro showed he’s again picking up rhythm after the absence due to injury. Not so much else to write home about. Yesterday we had game #2 out of 38 (God, it’s a long way to the top if you wanna rock ‘n’ roll), this time against ASA from the state of Alagoas, north-eastern Brazil. What to be expected from the first away game? Kleina seemed more cautious, replacing striker Vinícius (who in any case was out due to a slight muscle injury) with Wesley to strengthen the midfield. Not a popular decision: Kleina was called both this and that on social medias during the hours preceding the game. At halftime, Palmeiras was up three to nil – Kleber (finally! ), Juninho and Tiago Real. Second half and Palmeiras did nothing but administer the advantage, certainly (and correctly) contemplating the next few week’s marathon of games. In all fairness, Palmeiras didn’t play brilliantly. But ASA played much worse. It was in any case one of those nights where all shots find their way into the back of the net: Palmeiras’ three goals were all perfectly defendable, but the supreme scriptmaster wished differently. Not much in terms of individual achievements, with one exception: Leandro. The striker was found deeper down on the pitch, seeking the ball and distributing. So much that all three goals originated from his feet. Kleina improvising, as we still are #10-less. 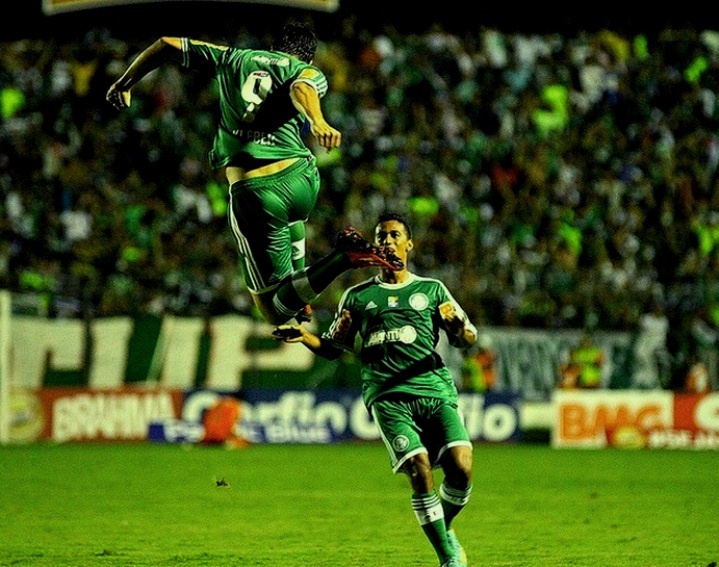 Two teams currently on maximum points: Palmeiras and Figueirense, Palmeiras on top. The Verdão’s next game is on Saturday against América/MG, trailing in the bottom after two defeats.